This has been sitting on my shelf for some time and I’ve been eager to read it but for all the review titles I get sent (though I’m definitely not complaining). However, I couldn’t leave it any longer and now I’m desperate to get hold of the last book in this exceptional trilogy. 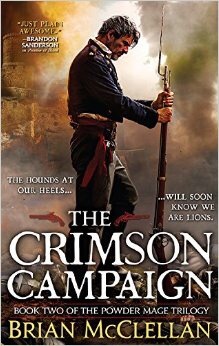 I reviewed Promise of Blood here and can safely say, The Crimson Campaign is just as exciting and just as epic. Once again, the majority of the action centres around Field Marshal Tamas, his son Taniel Two-Shot and Inspector Adamat. Tamas is trying to combat the Kez army from invading Adro but is battling an enemy who have the power and wrath of an injured god backing them. Taniel, after surviving the devastating battle of South Pike, finds himself back on the frontline along with his companion Ka-Poel, an enigmatic young women. Adamat, having confessed his forced treachery to Tamas, is desperate to find his family and is in the hunt for his enemy, Lord Vetas. Each plot line intertwines and affects the other brilliantly. Tamas is caught behind enemy lines and must fight his way back to Adro against all odds. Taniel finds himself fighting against a military command who thinks his father dead and retreat as the only option. Adamat, caught in a game of cat and mouse, must capture a villain more cunning and vile than he’s ever encountered before. Each has a protagonist to better, obstacles to overcome and help from unlikely places. Ka-Poel, especially, is revealed to be more powerful than anyone, including Taniel, could imagine. The book, at nearly 600 pages, burns along at a terrific pace, each plot line building and keeping interest. This is proper epic fantasy, helped all the more by the stunning worldbuilding, excellent characters and all-out action adventure. There’s tales of vengeance woven throughout; of heroism and bravery. Yet, there is also the political machinations of Tamas’s post-revolution at play in the background witnessed by Adamat. Equally, Taniel discovers more than just cowardice behind the retreating Adro army. Finally, there is Nila – a seemingly peripheral figure at first – who is revealed to be more than just a laundress. There’s a lot going on in this second instalment and I’ve hardly touched on a number of things. That said, there’s no extra fat. It’s all flintlock fire-fights, magic and mages, gods and powerful politicians and it’s awesome.